Samsung TV .NET App Templates for Tizen. Develop Tizen Application and Library with C# Language in Visual Studio 2017. The Samsung TV .NET App Templates provides basic templates for developing Tizen .NET application. 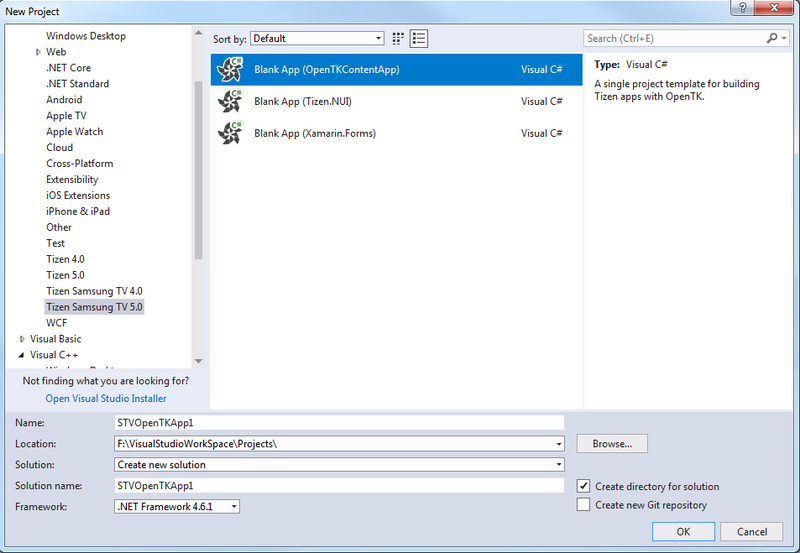 The Visual Studio Tools for Tizen provides Visual Studio extension that enables developing Tizen .NET applications. To create the projects, Templates can be found in C#->Tizen Samsung TV "VERSION".0. For more information about the extension, visit http://developer.samsung.com/tv. For developing game with C#, developer usually using game engine like Unity, UE4, etc. For using OpenGL in C#, OpenTK is a fast, low-level C# binding for OpenGL, OpenGL ES and OpenAL. It runs on all major platforms and powers hundreds of apps, games and scientific research. A multi project template for building apps with Xamrin.Forms, sharing code using a .NET Standard library. Platform specific features (TizenFX, TizenFX TV) are supported in this template. A Single project template for building Tizen NUI apps with TizenFX TV. TizenFX API allows you to access platform-specific features not covered by the generic .NET and Xamarin.Forms features, such as system information and status, sensor date, and account and connectivity services. Tizen common .NET feature and additional TV feature are supported. Built app using this template can be run on Samsung TVs with Tizen 4.0 or above. It is not compatible with other Tizen devices. Minor Update:- changes in OpenTK Content App TEMPLATE.